Cardston, Alberta - October 31, 2018 (Newsfile Corp.) (Investorideas.com Newswire) American Creek Resources (TSXV: AMK) (OTC Pink: ACKRF) (the "Company" or "American Creek") is pleased to report its JV partner Tudor Golds results from four holes of the nine-hole 2018 drill program on the Copper Belle zone of the Company's Treaty Creek property, in the "Golden Triangle" area of north-western BC. The deep drilling program is now finished for the season and results of core sampling have been received for six of the nine holes completed. The first two holes were reported in the August 23 news release. Walter Storm, President and CEO, stated: "As the assay results come in from our deep drilling program at Copper Belle, the gold mineralized zone is really taking shape. We are seeing thick intervals of good gold grades in our northernmost hole reported to date. 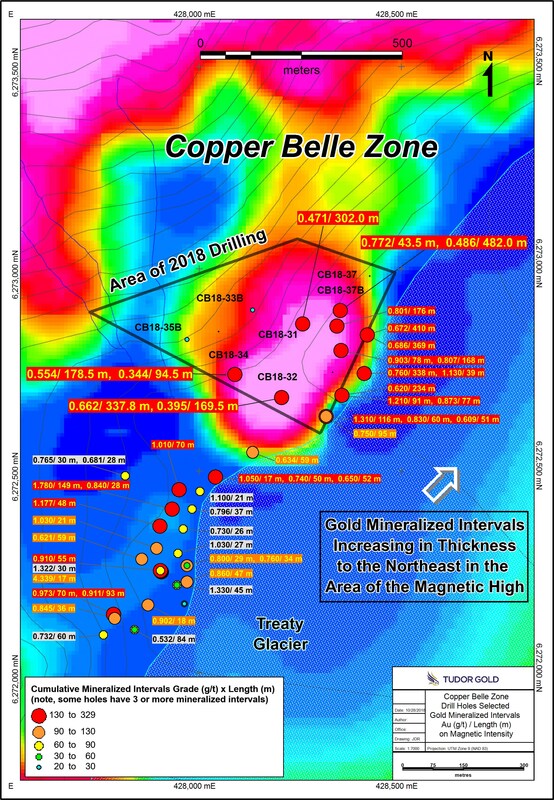 This indicates to us that the strong Copper Belle mineralization may continue to the north-northeast of our current drilling." The nine holes drilled in 2018 covered an area measuring approximately 370 meters by 250 meters, to depths of 600 to 900 meters. Based on the wide gold intervals received to date, the results are expected to considerably increase the range of potential ounces of gold from the 1.8 to 1.9 million ounces contained within 50 to 45 million tonnes grading 1.12 to 1.35 g/t Au determined from the drill results prior to 2018. A new range of gold ounces and grades will be determined, incorporating all drill results to the end of 2018 drilling, once the final assays are received and compiled. The 2018 drilling has now extended the known length of the porphyry-style mineralized system for over 1100 meters. For locations of the 2018 and other holes in the Copper Belle area that are overlain on Total Magnetics contours, please view the map below. The Copper Belle zone has an elongate north-northeast trend, dipping at a relatively flat angle to the northwest. Mineralization may be related to an extensive north-northeast trending tectonic zone, similar to the distribution of the four KSM deposits on Seabridge's property that are located along a ten kilometer length of the Sulphurets Thrust Fault zone. Drill core samples were prepared at ALS Global's Preparation Laboratory in Terrace, BC and assayed at ALS Global's Geochemical Laboratory in North Vancouver, BC. Analytical accuracy and precision are monitored by the submission of blanks, certified standards and duplicate samples inserted at regular intervals into the sample stream by Tudor Gold personnel. ALS Global Laboratories quality system complies with the requirements for the International Standards ISO 17025: 2005. The Company also holds the Gold Hill (drill program currently running), Austruck-Bonanza, Ample Goldmax, Silver Side, and Glitter King properties located in other prospective areas of the province. For further information please contact Kelvin Burton at: Phone: 403 752-4040 or Email: info@americancreek.com. Information relating to the Company is available on its website at www.americancreek.com.